I’ve been reviewing my tush off this week. I really have a few gems that I wanted to share with all of you. Sweet Pea Diapers is one of them. They are on my recommendations list for a reason. Autumn recommended them as well and I’ve also added the Sweet Pea One Size Covers. It is one of my favorites for nights and naps. I received these diapers for purpose of review. However, all views expressed are my honest and true opinion. Sweet Pea Diapers is a Canadian based company that manufacturers their products responsibly in China. You can find their products not only here in North America, but at retailers all over the world, I see one as far away as Australia! I’ve linked the product pages so you can see all the details. But if you want to order please go HERE because you can only place wholesale orders directly from their website. 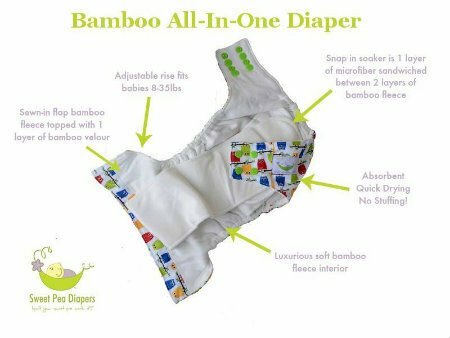 First up is the Sweet Pea Bamboo All in One Diaper (AIO)! Its adjustable rise is labeled for sizes 8-35 pounds. The inserts are made up of a sewn in bamboo fleece topped with bamboo velour which is a buttery soft top layer that goes against baby’s skin. There is an additional snap in soaker that is a layer of microfiber sandwiched between two layers of bamboo fleece. What all that means is that this is a super absorbent AIO that you won’t have to add anything to. There is a PUL tummy panel which is great to prevent wicking on belly sleepers. The materials used are good quality and the cloth diaper is well made. I’ve been using them for five months now and I think they have held up really well. It washes and dries easily and while the extra insert is snapped in, it usually stays that way in the wash. I just have to fold them back in and we are all set. I just want to point out that this is not a super big diaper. Sophia still fits, but barely. She is around 31 pounds now. That does fall in with the labeled sizing. If you are looking for something for older toddlers 2.5 and up, this probably isn’t the best choice. The Sweet Pea Bamboo All in One is an EXCELLENT budget priced AIO option if you getting them earlier though. 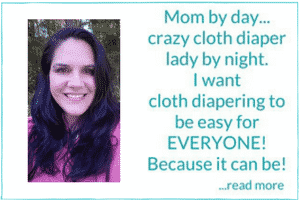 They certainly have the absorbency and sizing to get most babies through to potty training with no problem. I LOVE it! This cover has the rise that I need (fits bigger than the AIO). It’s made of quality materials. The elastic has held up really well and the snaps are strong. The best part though, in my humble opinion, are the double leg gussets! Stuffed with 4 large inserts. You could stuff a mattress in these covers and not get leg gaps and leaks. That is the beauty of a double gusset leg. The fit is great and they are easy to get over anything without having to do a ton of finagling and adjusting. I like to use my Sweet Pea covers (I need to get more) for naps and nights. Sophia is currently using three large Thirsties Hemp Inserts with one bamboo insert on top for fast absorption. All four layers fit perfectly into these covers. You could also use them as covers over fitteds, prefolds and flats. They are an awesome price and really versatile. Plus, I’m pretty confident saying that if Sophia still needs diapers when she is three (hopefully she won’t!) that these Sweet Pea Covers will still fit her no problem. 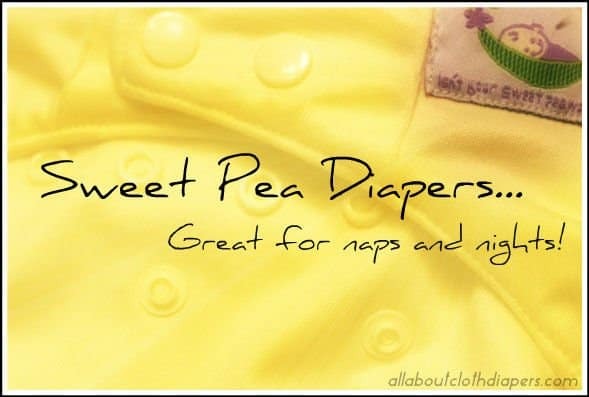 Sweet Pea Diapers is generously sponsoring a giveaway for All About Cloth Diapers readers. The winner will get a Sweet Pea Bamboo AIO AND a One Size Cover. 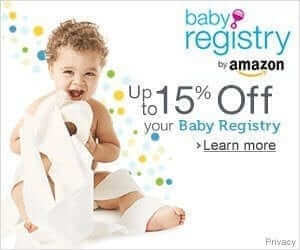 Please use the rafflecopter form below to enter. We’d love for you to LIKE our Facebook pages and would LOVE if you shared this with your friends! Thanks for reading my review and good luck! A Natural Deodorant That Doesn’t Stink! Now that your daughter is a little older, which do you like better for nights, sweet pea cover (with inserts listed in your blog) or kawaii good night heavy wetter?? Sweet pea as they have the double gusset legs. You can stuff a mattress in and not get gaps. Love the butter and penguin covers! Website isn’t working for me correctly right now but I do like the dark and medium blues and I think I would like the chevron but can’t see the print. i love the sheep, raccoon, owl, and penguin prints or anything little animals!! I like the Silver and Sapphire!! I really like the baby pink. I like the sapphire color. I would be interested to see the sheep print, a lot of the options weren’t showing up on their site. I like the raccoons and the sheep. I like the green apple and raccoon. The sheep print is so cute!!! I love the owl print! So cute! i like the yellow and red colors! I like the sheep print! I love the racoon and sheep! I like the black and the chevron, I couldn’t see any other prints. I love the indigo blue and the apple green! So cute and neutral! Love the red cover & the light mint green one – so adorable! I like their new raccoon print. I love that their diapers have double gussets. I feel that covers that do fit better over bulky nighttime solutions. Be it fitteds or flats and prefolds. In love with the new raccoon and sheep prints! i like the penguins best. I love the owls print! I like the cover in black. I love the penguin print! I like the Apple green. I LOVE the penguins, would love to give this a try! I my favorite Sweet Pea print is Racoons! Thanks for the review and the chance at winning this giveaway! I like the Chevron print. Hard to decide on fav but the owls print is really fun! I also like a solid blank coloured diaper, looks so smart! Adore raccoon and penquin prints. I LOVE the penguins! Those are so cute! I liked the red cover and the penguins. I couldn’t view the other prints for some reason. Definitely the raccoons! So glad to see a new animal trending in the cloth diaper world LOL! I like the penguin print the best. It is so adorable. I like the sheep print. I really like the Owl print and Sapphire color! Love all the bright colors and the penguins! They are all cute but sapphire and paisley at my favorites! I’m having trouble viewing most of the prints which is sad cause I’d love to see what the racoons and sheep look like. The penguins are very cute though! And they have a lovely selection of solid colors too. I love sweet pea covers and need some replacements for the ones going on 4 years and three kids???? Would love to try the cloth diapers! I love love the sweet pea covers. I like the paisley print. But now I’m in love with the new print with Sheep on the cover. Dying to try the aio though. The penguins are so cute! The penguins are too cute! I’m confused by people’s comments about a globe print….does Sweet Pea have a globe print now?? I like sapphire and indigo blue! i love the owl print :) usually owl prints look too girly for me but i’d put this one on my boys bum! I like the raccoon print. So cute! Love all the bright solids and the chevron. Desperately need a good night time solution and really want to try these now! I like the penguin print. I like simple solids in gender neutral colors, like Silver. Love the penguins! Sounds like a great cover! my sweet pea covers are my favorite! I would like to try the aio! I like the penguin print, very cute! I have a darker turquoise and a lighter colored turquoise (not sure if it was an oops or an old solid) but I love them. As for prints, I love the owls, but I’m excited to get one of the new sheep ones; it’s an absolutely adorable print! I love the owls and raccoons. The penguins are adorable! Perfect for boys or girls! I’ve been looking for a better overnight diaper. This looks like a great option. Thanks for the recommendation! I like pink and purple! I’ve heard a lot about Sweet Pea diapers lately. I’d love to give them a try. I love the Paisley print, but I have something similar in another brand, so maybe I’d choose the Owls print. I really like the red Chevron. We love our sweet pea cover! Love the prints they are so much fun especially the chevron. I’ve been reading a lot on best diapers for overnight and am glad to have this on my list to try! I like globe print! It is awesome! I like the black cover with black snaps. Clean and simple. I’m a fan of the new raccoon print and the purple color is really pretty too!! I like the raccoon and sheep and penguin….love the animal prints! I love this review!!! I absolutely love the raccoon print on the sweet pea covers and the red chevron is great also, this is definitely the cover I’m going to give a try next, I had been debating between these and blueberry covers but you can’t beat the price of the sweet pea, thanks for the review Jen, your great!!! I like the raccoons the best, but I don’t see it on the site. I love, love, love Penguins! Love the blue and the retro print! I like the chevron prints the best. Wait, definitely like the Penguins the best! I really like the orange color! I love the globe snap!!! SOOOOO adorable!! I heart globe! That is my favorite print ever. So, so, so cute.